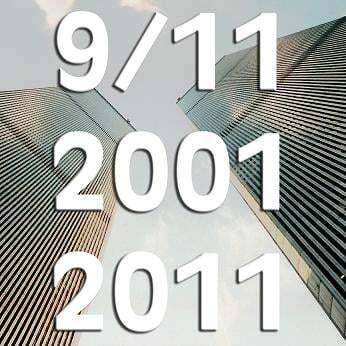 September 11: What will you be doing? September 11, 2001 provided a justification for waging a war without borders. Washington’s agenda consists in extending the frontiers of the American Empire to facilitate complete U.S. corporate control, while installing within America the institutions of the Homeland Security State. With the 10 year anniversary of 9/11 fast approaching, Global Research wants to let our readers know how they can participate in commemorative conferences and get more information on the event which so drastically affected the course of geopolitics, global militarization and international law in the last ten years. 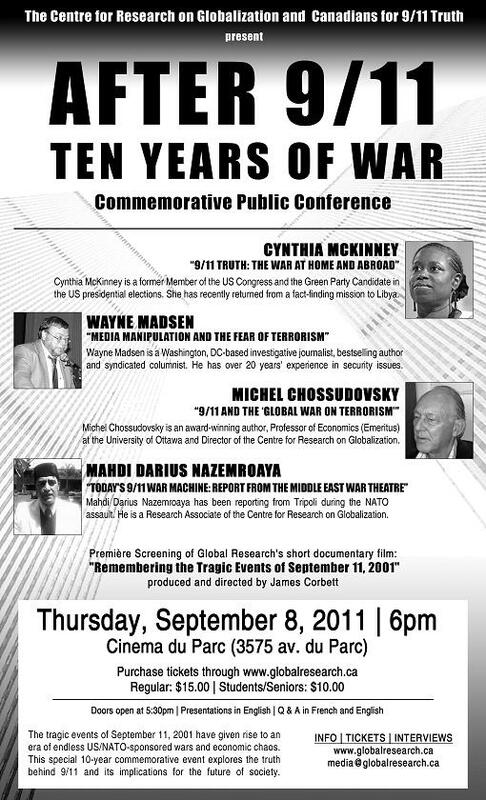 Cynthia McKinney will be speaking on “9/11 Truth: The War at Home and Abroad”. She is a former Member of the US Congress and the Green Party Candidate in the US presidential elections. She has recently returned from a fact-finding mission to Libya. Wayne Madsen will be speaking on “Media Manipulation and the Fear of Terrorism”. He is a Washington, DC-based investigative journalist, bestselling author and syndicated columnist. He has over 20 years’ experience in security issues. Michel Chossudovsky will be speaking on “9/11 and the “Global War on Terrorism” (GWOT)”. He is an award-winning author, Professor of Economics (Emeritus) at the University of Ottawa and Director of the Centre for Research on Globalization. Mahdi Darius Nazemroaya will be speaking on “Today’s 9/11 War Machine: Report from the Middle East War Theatre”. He has been reporting during the last two months from Tripoli. He is a Research Associate of the Centre for Research on Globalization. SEE POSTER BELOW. EVENT STARTS AT 6 O’CLOCK SHARP, DOORS OPEN AT 5:30. Presentations in English, Q and A in French and English. Screening and discussion on latest developments in Libya and Syria and the dangers of military escalation. Mahdi Darius Nazemroaya has been reporting during the last two months from Tripoli. He is a Research Associate of the Centre for Research on Globalization. Michel Chossudovsky is an award-winning author, Professor of Economics (Emeritus) at the University of Ottawa and Director of the Centre for Research on Globalization. He has recently returned from Syria. Among the speakers are: Michael Keefer, Matthew Witt, Lance deHaven-Smith, David Ray Griffin, Kevin Ryan, Jay Kolar, Paul Zarembka, Richard Gage, Michel Chossudovsky, Cynthia McKinney, Graeme MacQueen, David Chandler, Jon Cole, Niels Harrit, Peter Dale Scott, Laurie Manwell, Mike Gravel, 9/11 family members. In this expanded edition of Michel Chossudovsky’s 2002 best seller, the author blows away the smokescreen put up by the mainstream media, that 9/11 was an attack on America by “Islamic terrorists”. Through meticulous research, the author uncovers a military-intelligence ploy behind the September 11 attacks, and the cover-up and complicity of key members of the Bush Administration. America’s “War on Terrorism” is available to purchase from Global Research! Michel Chossudovsky is the author of the international best-seller “The Globalization of Poverty ” published in thirteen languages. He is Professor of Economics (emeritus) at the University of Ottawa and Director of the Center for Research on Globalization which hosts the critically acclaimed website: www.globalresearch.ca. He is also a contributor to the Encyclopaedia Britannica. ORDER YOUR COPY OF America’s “War on Terrorism” TODAY! Global Research has an extensive archive of articles and videos on “9/11 & the ‘War on Terrorism'”. Browse and share!